There were just enough mathematically-themed comic strips last week for me to make two posts out of it. This current week? Is looking much slower, at least as of Wednesday night. But that’s a problem for me to worry about on Sunday. Eric the Circle for the 20th, this one by Griffinetsabine, mentions a couple of shapes. That’s enough for me, at least on a slow comics week. There is a fictional tradition of X marking the spot. It can be particularly credited to Robert Louis Stevenson’s Treasure Island . Any symbol could be used to note a special place on maps, certainly. Many maps are loaded with a host of different symbols to convey different information. Circles and crosses have the advantage of being easy to draw and difficult to confuse for one another. Squares, triangles, and stars are good too. Eric the Circle for the 20th of December, 2018, this one by Griffinetsabine. This and other essays featuring Eric the Circle are at this link. Bill Whitehead’s Free Range for the 22nd spoofs Wheel of Fortune with “theoretical mathematics”. Making a game out of filling in parts of a mathematical expression isn’t ridiculous, although it is rather niche. I don’t see how the revealed string of mathematical expressions build to a coherent piece, but perhaps a few further pieces would help. Bill Whitehead’s Free Range for the 22nd of December, 2018. Appearances by Free Range should be at this link. The parts shown are all legitimate enough expressions. Well, like is only true for some specific numbers ‘a’ and ‘b’, but you can find solutions. is just an expression, not picking out any particular values of ‘b’ or ‘x’ or ‘y’ as interesting. But in conjunction with or other expressions there might be something useful. On the second row is a graph, highlighting a region underneath a curve (and above the x-axis) between two vertical lines. This is often the sort of thing looked at in calculus. It also turns up in probability, as the area under a curve like this can show the chance that an experiment will turn up something in a range of values. And is a straightforward differential equation. Its solution is a family of similar-looking polynomials. Mark Pett’s Lucky Cow for the 22nd of December, 2018. This and other discussions inspired by Lucky Cow should be at this link. Mark Pett’s Lucky Cow for the 22nd has run before. I’ve even made it the title strip for a Reading the Comics post back in 2014. So it’s probably time to drop this from my regular Reading the Comics reporting. The physicists comes running in with the left half of the time-dependent Schrödinger Equation. This is all over quantum mechanics. In this form, quantum mechanics contains information about how a system behaves by putting it into a function named . Its value depends on space (‘x’). It can also depend on time (‘t’). The physicists pretends to not be able to complete this. Neil arranges to give the answer. Schrödinger’s Equation looks very much like a diffusion problem. Normal diffusion problems don’t have that which appears in the part of Neil’s answer. But this form of equation turns up a lot. If you have something that acts like a fluid — and heat counts — then a diffusion problem is likely important in understanding it. And, yes, the setup reminds me of a mathematical joke that I only encounter in lists of mathematics jokes. That one I told the last time this strip came up in the rotation. You might chuckle, or at least be convinced that it is a correctly formed joke. Each of the Reading the Comics posts should all be at this link. And I have finished the alphabet in my Fall 2018 Mathematics A To Z glossary. There should be a few postscript thoughts to come this week, though. I’ve settled to a pace of about four comics each essay. It makes for several Reading the Comics posts each week. But none of them are monsters that eat up whole evenings to prepare. Except that last week there were enough comics which made my initial cut that I either have to write a huge essay or I have to let last week’s strips spill over to Sunday. I choose that option. It’s the only way to square it with the demands of the A to Z posts, which keep creeping above a thousand words each however much I swear that this next topic is a nice quick one. Roy Schneider’s The Humble Stumble rerun for the 25th of October, 2018. It originally ran the 30th of January, 2007. Stephan Pastis’s Pearls Before Swine for the 25th shows how we can use statistics to improve our lives. At least, it shows how tracking different things can let us find correlations. These correlations might give us information about how to do things better. It’s usually a shaky plan to act on a correlation before you have a working hypothesis about why the correlation should hold. But it can give you leads to pursue. Stephan Pastis’s Pearls Before Swine for the 25th of October, 2018. And from this we learn that Pig is not yet of the age where sometimes your neck and back hurt for three weeks because your pillow was a quarter-inch off its normal position. Bodies are fun things and everyone should have one. Shaenon K Garrity and Jeffrey C Wells’s Skin Horse for the 25th is a joke about mathematics being hard. In this case even for a being that’s a natural mathematician. Relatable. Shaenon K Garrity and Jeffrey C Wells’s Skin Horse for the 25th of October, 2018. Uh, the characters here are trapped inside an artificial intelligence and Virginia (the black-haired woman with clear glasses) has worked out the other characters are part of an intelligent swarm of bees and they’re trying to launch an escape, so this is why all the plot makes sense. 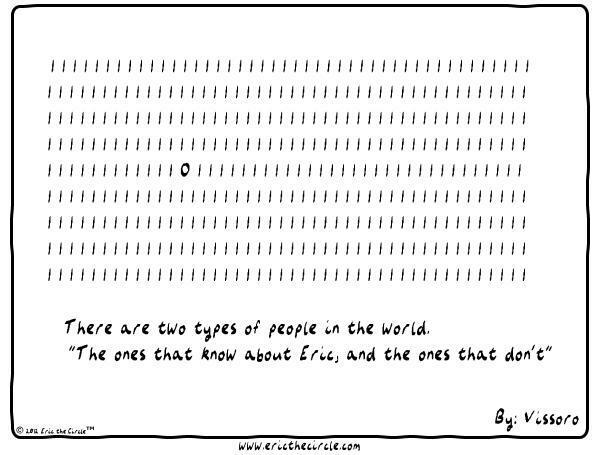 Eric the Circle for the 26th, this one by Vissoro, is a “two types of people in the world” joke. Given the artwork I believe it’s also riffing on the binary-arithmetic version of the joke. Which is, “there are 10 types of people in the world, those who understand binary and those who don’t”. Eric the Circle for the 26th of October, 2018, this one by Vissoro. It makes me think of that Futurama scene where Bender has a nightmare, dreaming of a 2. If you’d like to see more Reading the Comics posts, try this link. Essays mentioning The Humble Stumble are at this link. Essays discussing by Pearls Before Swine are at this link. Essays with a mention of Skin Horse should be at this link. I’m surprised to learn there are others, too. I’d have thought it was a new tag. Posts about what’s brought up by Eric the Circle should be at link. And this month and the rest of this year my Fall 2018 Mathematics A-To-Z should continue. And it is open for requests for more of the alphabet. I figure to do something rare, and retire one of my comic strip tags after today. Which strip am I going to do my best to drop from Reading the Comics posts? Given how many of the ones I read are short-lived comics that have been rerun three or four times since I started tracking them? Read on and see! Bill Holbrook’s On The Fastrack for the 29th of August continues the sequence of Fi talking with kids about mathematics. My understanding was that she tried to give talks about why mathematics could be fun. That there are different ways to express the same number seems like a pretty fine-grain detail to get into. But this might lead into some bigger point. That there are several ways to describe the same thing can be surprising and unsettling to discover. That you have, when calculating, the option to switch between these ways freely can be liberating. But you have to know the option is there, and where to look for it. And how to see it’ll make something simpler. Bill Holbrook’s On The Fastrack for the 29th of August, 2018. What … what graphic does she have on-screen? Bill Holbrook’s On The Fastrack for the 30th of August gets onto a thread about statistics. The point of statistics is to describe something complicated with something simple. So detail must be lost. That said, there are something like 2,038 different things called “average”. Each of them has a fair claim to the term, too. In Fi’s example here, 73 degrees (Fahrenheit) could be called the average as in the arithmetic mean, or average as in the median. The distribution reflects how far and how often the temperature is from 73. This would also be reflected in a quantity called the variance, or the standard deviation. Variance and standard deviation are different things, but they’re tied together; if you know one you know the other. It’s just sometimes one quantity is more convenient than the other to work with. Bill Holbrook’s On The Fastrack for the 30th of August, 2018. Somebody nag me sometime to tell the story about when I used Skylab’s torn-away meteorite shield for a heat-flow problem in a differential equations class. Thank you. Bill Holbrook’s On The Fastrack for the 1st of September has Fi argue that apparent irrelevance makes mathematics boring. It’s a common diagnosis. I think I’ve advanced the claim myself. I remember a 1980s probability textbook asking the chance that two transistors out of five had broken simultaneously. Surely in the earlier edition of the textbook, it was two vacuum tubes out of five. Five would be a reasonable (indeed, common) number of vacuum tubes to have in a radio. And it would be plausible that two might be broken at the same time. Bill Holbrook’s On The Fastrack for the 1st of September, 2018. Not to question Holbrook’s writing, since he somehow maintains three successful daily comic strips and may be presumed to know what he’s doing, but shouldn’t this have come before the strip from the 29th? It seems obvious that wanting to know an answer makes it easier to do the work needed to find it. I’m curious whether that’s been demonstrated true. Like, it seems obvious that a reference to a thing someone doesn’t know anything about would make it harder to work on. But does it? Does it distract someone trying to work out the height of a ziggurat based on its distance and apparent angle, if all they know about a ziggurat is their surmise that it’s a thing whose height we might wish to know? Tom Toles’s Randolph Itch, 2 am rerun for the 30th of August, 2018. It originally ran the 13th of January, 2000. Tom Toles’s Randolph Itch, 2 am rerun for the 30th of August is an old friend that’s been here a couple times. I suppose I do have to retire the strip from my Reading the Comics posts, at least, although I’m still amused enough by it to keep reading it daily. Simon Garfield’s On The Map , a book about the history of maps, notes that the X-marks-the-spot thing is an invention of the media. Robert Louis Stevenson’s Treasure Island particularly. Stevenson’s treasure map, Garfield notes, had to be redrawn from the manuscript and the author’s notes. The original went missing in the mail to the publishers. I just mention because I think that adds a bit of wonder to the treasure map. And since, I guess, I won’t have the chance to mention this again. Zach Weinersmith’s Saturday Morning Breakfast Cereal for the 30th of August, 2018. Interesting to me is that either the panel comic by itself, or the Venn diagram by itself, would be a sufficient joke. The panel would be a cryptic one, one that probably attracted ‘I don’t get it’ responses, but it’d be decipherable. 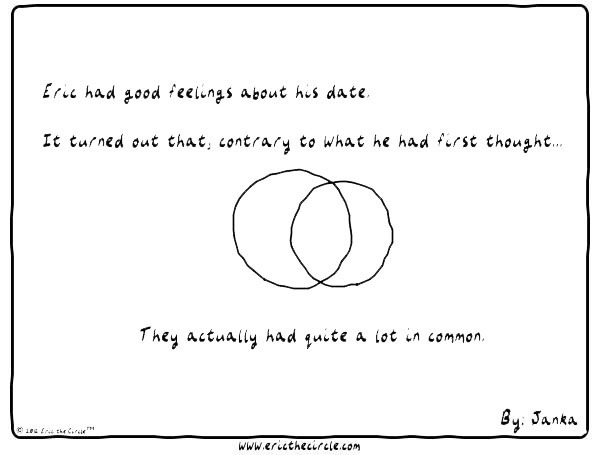 The Venn Diagram one would be fine, but wouldn’t have the tension and energy of the full strip. Zach Weinersmith’s Saturday Morning Breakfast Cereal for the 30th of August satisfies the need for a Venn Diagram joke this time around. 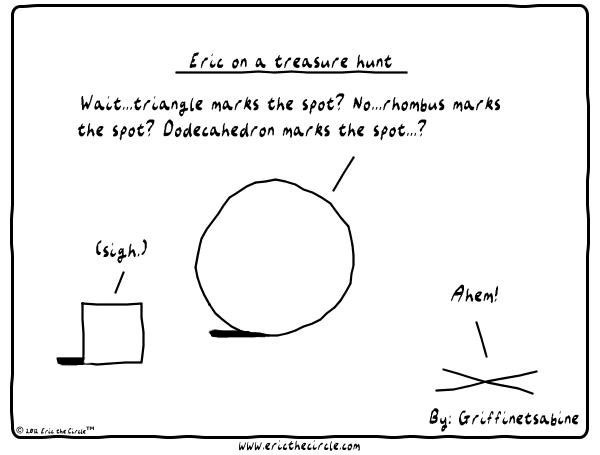 It’s also the strange-geometry joke for the week. Klein bottles were originally described by Felix Klein. They exist in four (or more) dimensions, in much the way that M&oum;bius strips exist in three. And like the M&oum;bius strip the surface defies common sense. You can try to claim some spot on the surface is inside and some other spot outside. But you can get from your inside to your outside spot in a continuous path, one you might trace out on the surface without lifting your stylus. If you were four-dimensional. Or more. If we were to see one in three dimensions we’d see a shape that intersects itself. As beings of only three spatial dimensions we have to pretend that doesn’t happen. It’s the same we we pretend a drawing of a cube shows six squares all of equal size and connected at right angles to one another, even though the drawing is nothing like that. The bottle-like shape Weinersmith draws is, I think, the most common representation of the Klein bottle. It looks like a fancy bottle, and you can buy one as a novelty gift for a mathematician. I don’t need one but do thank you for thinking of me. MathWorld shows another representation, a figure-eight-based one which looks to me like an advanced pasta noodle. But it doesn’t look anything like a bottle. Eric the Circle for the 31st of August, 2018. … Shouldn’t this be with a right triangle? Eric the Circle for the 31st of August, this one by JohnG, is a spot of wordplay. The pun here is the sine of an angle in a (right) triangle. That would be the length of the leg opposite the angle divided by the length of the hypotenuse. This is still stuff relevant to circles, though. One common interpretation of the cosine and sine of an angle is to look at the unit circle. That is, a circle with radius 1 and centered on the origin. Draw a line segment opening up an angle θ from the positive x-axis. Draw it counterclockwise. That is, if your angle is a very small number, you’re drawing a line segment that’s a little bit above the positive x-axis. Draw the line segment long enough that it touches the unit circle. That point where the line segment and the circle intersect? Look at its Cartesian coordinates. The y-coordinate will be the sine of θ. The x-coordinate will be the cosine of θ. The triangle you’re looking at has vertices at the origin; at x-coordinate cosine θ, y-coordinate 0; and at x-coordinate cosine θ, y-coordinate sine θ. Bill Griffith’s Zippy the Pinhead for the 1st of September, 2018. Somebody nag me sometime to save that last panel for my next What’s Going On In Mary Worth plot recap. Bill Griffith’s Zippy the Pinhead for the 1st of September is its usual sort of nonsense, the kind that’s up my alley. It does spend two panels using arithmetic and algebra as signifiers of intelligence, or at least thoughtfulness. My other Reading the Comics posts should appear at this link. Other essays with On The Fastrack are at this link. The essays that mentioned Randolph Itch, 2 am, are at this link, and I suppose this will be the last of them. We’ll see if I do succeed in retiring the tag. Other appearances by Saturday Morning Breakfast Cereal are at this link. The strip comes up here a lot. 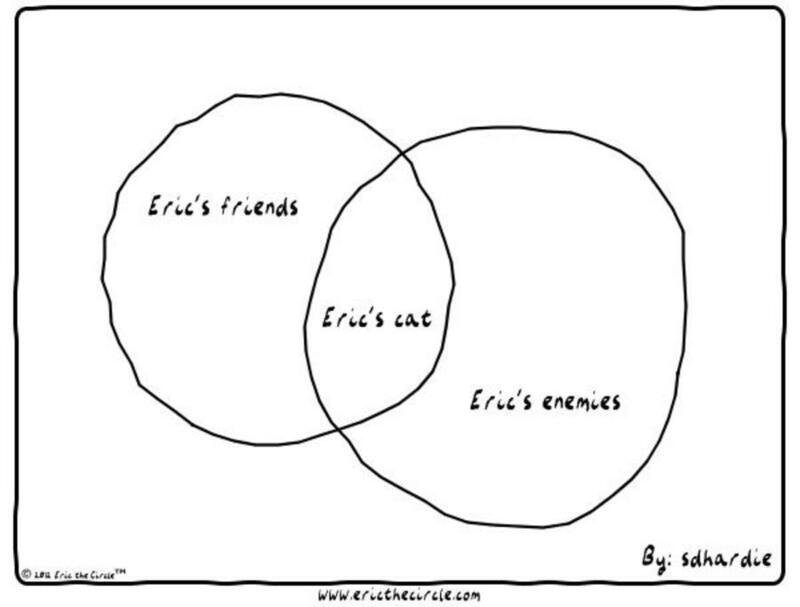 Eric the Circle comics should be at this link. And other essays with Zippy the Pinhead mentions should be at this link. Thank you. Although the hyperbolic cosine is interesting and I could go on about it. Eric the Circle for the 18th of June is a bit of geometric wordplay for the week. A secant is — well, many things. One of the important things is it’s a line that cuts across a circle. It intersects the circle in two points. This is as opposed to a tangent, which touch it in one. Or missing it altogether, which I think hasn’t got any special name. “Secant” also appears as one of the six common trig functions out there. Eric the Circle for the 18th of June, 2018. This one was composed by Griffinetsabine. It originally appeared sometime in 2012. In value the secant of an angle is just the reciprocal of the cosine of that angle. Where the cosine is never smaller than -1 nor larger than 1, the secant is always either greater than 1 or smaller than -1. It’s a useful function to have by name. We can write “the secant of angle θ” as . The otherwise sensible-looking is unavailable, because we use that to mean “the angle whose cosine is θ”. 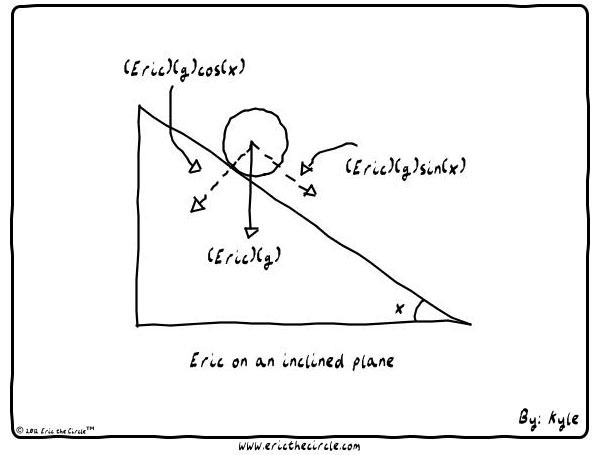 We need to express that idea, the “arc-cosine” or “inverse cosine”, quite a bit too. And would look like we wanted the cosine of one divided by θ. Ultimately, we have a lot of ideas we’d like to write down, and only so many convenient quick shorthand ways to write them. And by using secant as its own function we can let the arc-cosine have a convenient shorthand symbol. These symbols are a point where you see the messy, human, evolutionary nature of mathematical symbols at work. We can understand the cosine of an angle θ by imagining a right triangle with hypotenuse of length 1. Set that so the hypotenuse makes angle θ with respect to the x-axis. Then the opposite leg of that right triangle will be the cosine of θ away from the origin. The secant, now, that works differently. Again here imagine a right triangle, but this time one of the legs has length 1. And that leg is at an angle θ with respect to the x-axis. Then the far leg of that right triangle is going to cross the x-axis. And it’ll do that at a point that’s the secant of θ away from the origin. Larry Wright’s Motley Classics for the 19th of June, 2018. It originally ran sometime in 1997. Olivia Jaimes’s Nancy for the 19th of June, 2018. This one originally appeared in June of 2018. Olivia Jaimes’s Nancy for the 19th is a joke on getting students motivated to do mathematics. Set a problem whose interest people see and they can do wonderful things. Dave Whamond’s Reality Check for the 19th of June, 2018. Those seem like small drinks for circles that large. Dave Whamond’s Reality Check for the 19th is our Venn Diagram strip for the week. I say the real punch line is the squirrel’s, though. Properly, yes, the Venn Diagram with the two having nothing in common should still have them overlap in space. There should be a signifier inside that there’s nothing in common, such as the null symbol or an x’d out intersection. But not overlapping at all is so commonly used that it might as well be standard. Teresa Bullitt’s Frog Applause for the 21st of June, 2018. It’s a Dadaist comic strip; embrace the bizarreness. Teresa Bullitt’s Frog Applause for the 21st uses a thought balloon full of mathematical symbols as icon for far too much deep thinking to understand. I would like to give my opinion about the meaningfulness of the expressions. But they’re too small for me to make out, and GoComics doesn’t allow for zooming in on their comics anymore. I looks like it’s drawn from some real problem, based on the orderliness of it all. But I have no good reason to believe that. If you’d like more of these Reading the Comics posts, you can find them in reverse chronological order at this link. 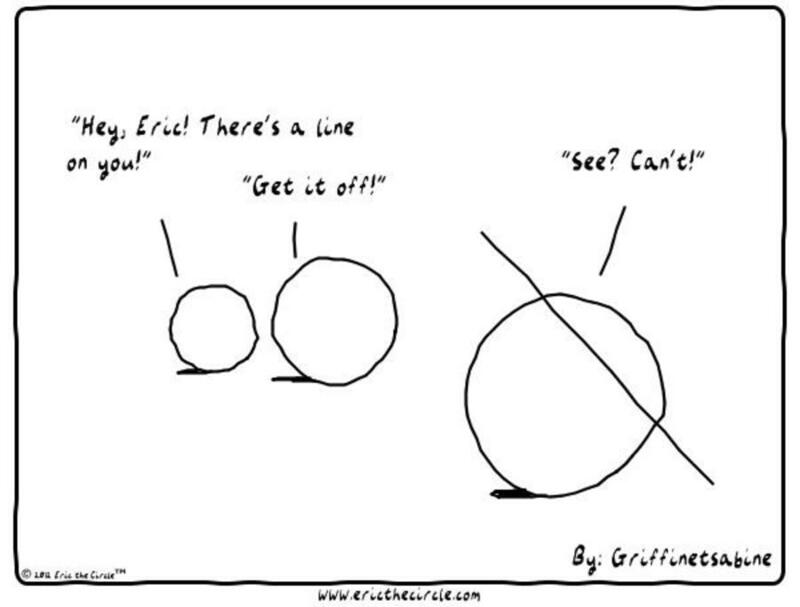 If you’re interested in the comics mentioned particularly here, Eric the Circle strips are here. Frog Applause comics are on that link. Motley strips are on that link. Nancy comics are on that page. And And Reality Check strips are here. Hi, all. I apologize for being late in posting this, but my Friday and Saturday were eaten up by pinball competition. Pinball At The Zoo, particularly, in Kalamazoo, Michigan. There, Friday, I stepped up first thing and put in four games on the Classics, pre-1985, tournament bank and based on my entry scores was ranked the second-best player there. And then over the day my scores dwindled lower and lower on the list of what people had entered until, in the last five minutes of qualifying, they dropped off the roster altogether and I was knocked out. Meanwhile in the main tournament, I was never even close to making playoffs. But I did have a fantastic game of Bally/Midway’s World Cup Soccer , a game based on how much the United States went crazy for soccer that time we hosted the World Cup for some reason. The game was interrupted by one of the rubber straps around one of the kickers (the little triangular table just past the flippers that you would think would be called the bumpers) breaking, and then by the drain breaking in a way that later knocked the game entirely out of the competition. So anyway besides that glory I’ve been very busy trying to figure out what’s gone wrong and stepping outside to berate the fox squirrels out back, and that’s why I’m late with all this. I’m sure you relate. Bill Holbrook’s Kevin and Kell rerun for the 15th of April, 2018. The strip is this enormously tall format because at the time it originally ran (in 2012) the strip appeared in print in the Atlanta Journal-Constitution, sharing the page with Wiley Miller’s similarly-formatted Non Sequitur . The strip has since resumed more normal dimensions. Bill Holbrook’s Kevin and Kell rerun for the 15th is the anthropomorphic numerals strip for the week. Also the first of the anthropomorphic strips for the week. Calculating taxes has always been one of the compelling social needs for mathematics, arithmetic especially. If we consider the topic to be “accounting” then that might be the biggest use of mathematics in society. At least by humans; I’m not sure how to rate the arithmetic that computers do even for not explicitly mathematical tasks like sending messages back and forth. New comic strip tag for around here, too. Bill Schorr’s The Grizzwells for the 17th of April, 2018. Yeah, people say that, but then they get into Abstract Algebra and then they see any proof whatsoever that involves ideals of rings. Bill Schorr’s The Grizzwells for the 17th sees Fauna not liking trigonometry class. I’m sympathetic. I remember it as seeming to be a lot of strange new definitions put to vague purposes. On the bright side, when you get into calculus trigonometry starts solving more problems than it creates. On the dim side, at least when I took it they tried to pass off “trigonometric substitution” as a thing we might need. (OK, it’s come in useful sometimes, but not as often as the presentation made it look.) Also a new comic strip tag. Eric the Circle for the 18th, this one by sdhardie, is a joke in the Venn Diagram mode. The strip’s a little unusual for not having one of the circles be named Eric. Not a new comic strip tag. Ham’s Life on Earth for the 19th of April, 2018. I suppose that Ham is a pseudonym but I have no information about the cartoonist other than that I guess she’s not American. Ham’s Life on Earth for the 19th leaves me feeling faintly threatened. Maybe it’s just me. Also not a new comic strip tag, somehow. Lord Birthday’s Dumbwitch Castle for the 19th of April, 2018. I … I would swear when this comic first started appearing it was by a less absurd pseudonym. I don’t remember, though. Lord Birthday’s Dumbwitch Castle for the 19th is a small sketch and mostly a list of jokes. This is the normal format for this strip, which tests the idea of what makes something a comic strip. I grant it’s a marginal inclusion, but I am tickled by the idea of a math slap so here you go. This one’s another new comic strip tag. Hilary Price and Rina Piccolo’s Rhymes with Orange for the 1st of February, 2018 gives us an anthropomorphic geometric figures joke for the week. Also a side of these figures that I don’t think I’ve seen in the newspaper comics before. It kind of raises further questions. Hilary Price and Rina Piccolo’s Rhymes with Orange for the 1st of February, 2018. All right, but they’re line segments, but I suppose you can’t reasonably draw infinitely vast things in a daily newspaper strip’s space. The lean of that triangle makes it look way more skeptical, even afraid, than I think Price and Piccolo intended, but I’m not sure there’s a better way to get these two in frame without making the composition weird. Jason Chatfield’s Ginger Meggs for the 1st just mentions that it’s a mathematics test. Ginger isn’t ready for it. Mark Tatulli’s Heart of the City rerun for the 1st finally has some specific mathematics mentioned in Heart’s efforts to avoid a mathematics tutor. The bit about the sum of adjacent angles forming a right line being 180 degrees is an important one. A great number of proofs rely on it. I can’t deny the bare fact seems dull, though. I know offhand, for example, that this bit about adjacent angles comes in handy in proving that the interior angles of a triangle add up to 180 degrees. 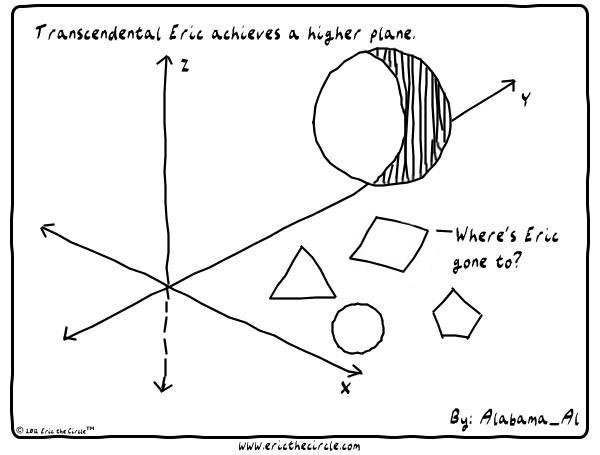 At least for Euclidean geometry. And there are non-Euclidean geometries that are interesting and important and for which that’s not true. Which inspires the question: on a non-Euclidean surface, like say the surface of the Earth, is it that adjacent angles don’t add up to 180 degrees? Or does something else in the proof of a triangle’s interior angles adding up to 180 degrees go wrong? 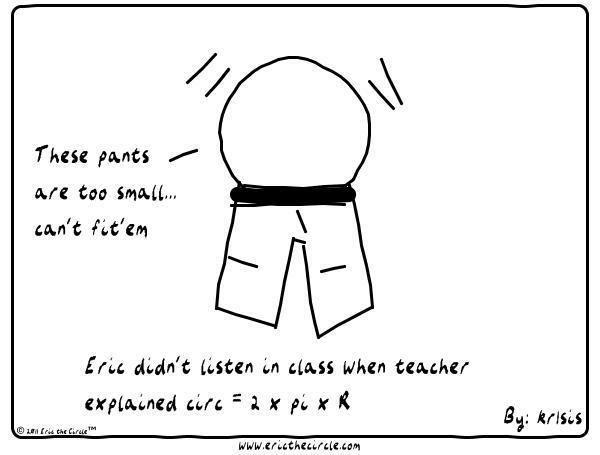 The Eric the Circle rerun for the 2nd, by JohnG, is one of the occasional Eric s that talk about π and so get to be considered on-topic here. Bill Whitehead’s Free Range for the 2nd features the classic page full of equations to demonstrate some hard mathematical work. And it is the sort of subject that is done mathematically. The equations don’t look to me anything like what you’d use for asteroid orbit projections. I’d expect forecasting just where an asteroid might hit the Earth to be done partly by analytic formulas that could be done on a blackboard. And then made precise by a numerical estimate. The advantage of the numerical estimate is that stuff like how air resistance affects the path of something in flight is hard to deal with analytically. Numerically, it’s tedious, but we can let the computer deal with the tedium. So there’d be just a boring old computer screen to show on-panel. Bud Fisher’s Mutt and Jeff reprint for the 2nd is a little baffling. And not really mathematical. It’s just got a bizarre arithmetic error in it. Mutt’s fiancee Encee wants earrings that cost ten dollars (each?) and Mutt takes this to be fifty dollars in earring costs and I have no idea what happened there. Thomas K Dye, the web cartoonist who’s done artwork for various article series, has pointed out that the lettering on these strips have been redone with a computer font. (Look at the letters ‘S’; once you see it, you’ll also notice it in the slightly lumpy ‘O’ and the curly-arrow ‘G’ shapes.) So maybe in the transcription the earring cost got garbled? And then not a single person reading the finished product read it over and thought about what they were doing? I don’t know. Zach Weinersmith’s Saturday Morning Breakfast Cereal reprint for the 2nd is based, as his efforts to get my attention often are, on a real mathematical physics postulate. As the woman postulates: given a deterministic universe, with known positions and momentums of every particle, and known forces for how all these interact, it seems like it should be possible to predict the future perfectly. It would also be possible to “retrodict” the past. All the laws of physics that we know are symmetric in time; there’s no reason you can’t predict the motion of something one second into the past just as well as you an one second into the future. This fascinating observation took a lot of battery in the 19th century. Many physical phenomena are better described by statistical laws, particularly in thermodynamics, the flow of heat. In these it’s often possible to predict the future well but retrodict the past not at all. But that looks as though it’s a matter of computing power. We resort to a statistical understanding of, say, the rings of Saturn because it’s too hard to track the billions of positions and momentums we’d need to otherwise. A sufficiently powerful mathematician, for example God, would be able to do that. Fair enough. Then came the 1890s. Henri Poincaré discovered something terrifying about deterministic systems. It’s possible to have chaos. A mathematical representation of a system is a bit different from the original system. There’s some unavoidable error. That’s bound to make some, larger, error in any prediction of its future. For simple enough systems, this is okay. We can make a projection with an error as small as we need, at the cost of knowing the current state of affairs with enough detail. Poincaré found that some systems can be chaotic, though, ones in which any error between the current system and its representation will grow to make the projection useless. (At least for some starting conditions.) And so many interesting systems are chaotic. Incredibly simplified models of the weather are chaotic; surely the actual thing is. This implies that God’s projection of the universe would be an amusing but almost instantly meaningless toy. At least unless it were a duplicate of the universe. In which case we have to start asking our philosopher friends about the nature of identity and what a universe is, exactly. Ruben Bolling’s Super-Fun-Pak Comix for the 2nd is an installment of Guy Walks Into A Bar featuring what looks like an arithmetic problem to start. It takes a turn into base-ten jokes. There are times I suspect Ruben Bolling to be a bit of a nerd. Nate Fakes’s Break of Day for the 3rd looks like it’s trying to be an anthropomorphic-numerals joke. At least it’s an anthropomorphic something joke. Percy Crosby’s Skippy for the 3rd originally ran the 8th of December, 1930. It alludes to one of those classic probability questions: what’s the chance that in your lungs is one of the molecules exhaled by Julius Caesar in his dying gasp? Or whatever other event you want: the first breath you ever took, or something exhaled by Jesus during the Sermon on the Mount, or exhaled by Sue the T-Rex as she died. Whatever. The chance is always surprisingly high, which reflects the fact there’s a lot of molecules out there. This also reflects a confidence that we can say one molecule of air is “the same” as some molecule if air in a much earlier time. We have to make that supposition to have a problem we can treat mathematically. My understanding is chemists laugh at us if we try to suggest this seriously. Fair enough. But whether the air pumped out of a bicycle tire is ever the same as what’s pumped back in? That’s the same kind of problem. At least some of the molecules of air will be the same ones. Pretend “the same ones” makes sense. Please. 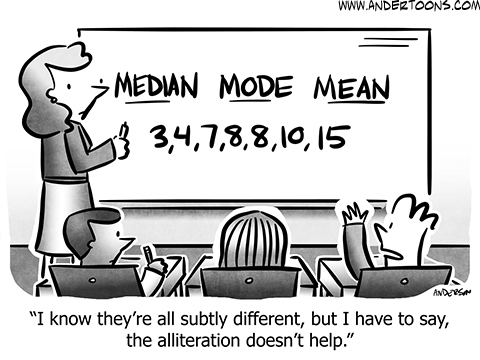 It was a slow week for mathematically-themed comic strips. What I have are meager examples. Small topics to discuss. The end of the week didn’t have anything even under loose standards of being on-topic. Which is fine, since I lost an afternoon of prep time to thunderstorms that rolled through town and knocked out power for hours. Who saw that coming? … If I had, I’d have written more the day before. Mac King and Bill King’s Magic in a Minute for the 29th of October looks like a word problem. Well, it is a word problem. It looks like a problem about extrapolating a thing (price) from another thing (quantity). Well, it is an extrapolation problem. The fun is in figuring out what quantities are relevant. Now I’ve spoiled the puzzle by explaining it all so. Olivia Walch’s Imogen Quest for the 30th doesn’t say it’s about a mathematics textbook. But it’s got to be. What other kind of textbook will have at least 28 questions in a section and only give answers to the odd-numbered problems in back? You never see that in your social studies text. Eric the Circle for the 30th, this one by Dennill, tests how slow a week this was. I guess there’s a geometry joke in Jane Austen? I’ll trust my literate readers to tell me. My doing the world’s most casual search suggests there’s no mention of triangles in Pride and Prejudice. The previous might be the most ridiculously mathematics-nerdy thing I have written in a long while. Tony Murphy’s It’s All About You for the 31st does some advanced-mathematics name-dropping. In so doing, it’s earned a spot taped to the door of two people in any mathematics department with more than 24 professors across the country. Or will, when they hear there was a gap unification theory joke in the comics. I’m not sure whether Murphy was thinking of anything particular in naming the subject “gap unification theory”. It sounds like a field of mathematical study. But as far as I can tell there’s just one (1) paper written that even says “gap unification theory”. It’s in partition theory. Partition theory is a rich and developed field, which seems surprising considering it’s about breaking up sets of the counting numbers into smaller sets. It seems like a time-waster game. But the game sneaks into everything, so the field turns out to be important. Gap unification, in the paper I can find, is about studying the gaps between these smaller sets. There’s also a “band-gap unification” problem. I could accept this name being shortened to “gap unification” by people who have to say its name a lot. It’s about the physics of semiconductors, or the chemistry of semiconductors, as you like. The physics or chemistry of them is governed by the energies that electrons can have. Some of these energies are precise levels. Some of these energies are bands, continuums of possible values. When will bands converge? When will they not? Ask a materials science person. Going to say that’s not mathematics? Don’t go looking at the papers. Whether partition theory or materials since it seems like a weird topic. Maybe Murphy just put together words that sounded mathematical. Maybe he has a friend in the field. Guy Gilchrist’s Nancy for the 1st does an alphabet soup joke, so like I said, it’s been a slow week around here. John Zakour and Scott Roberts’s Maria’s Day for the 2nd is really just mathematics being declared hated, so like I said, it’s been a slow week around here. It’s another week where everything I have to talk about comes from GoComics.com. So, no pictures. The Comics Kingdom and the Creators.com strips are harder for non-subscribers to read so I feel better including those pictures. There’s not an overarching theme that I can fit to this week’s strips either, so I’m going to name it for the one that was most visually interesting to me. Charlie Pondrebarac’s CowTown for the 22nd I just knew was a rerun. It turned up the 26th of August, 2015. Back then I described it as also “every graduate students’ thesis defense anxiety dream”. Now I wonder if I have the possessive apostrophe in the right place there. On reflection, if I have “every” there, then “graduate student” has to be singular. If I dropped the “every” then I could talk about “graduate students” in the plural and be sensible. I guess that’s all for a different blog to answer. Mike Thompson’s Grand Avenue for the 22nd threatened to get me all cranky again, as Grandmom decided the kids needed to do arithmetic worksheets over the summer. The strip earned bad attention from me a few years ago when a week, maybe more, of the strip was focused on making sure the kids drudged their way through times tables. I grant it’s a true attitude that some people figure what kids need is to do a lot of arithmetic problems so they get better at arithmetic problems. But it’s hard enough to convince someone that arithmetic problems are worth doing, and to make them chores isn’t helping. John Zakour and Scott Roberts’s Maria’s Day for the 22nd name-drops fractions as a worse challenge than dragon-slaying. I’m including it here for the cool partial picture of the fire-breathing dragon. Also I take a skeptical view of the value of slaying the dragons anyway. Have they given enough time for sanctions to work? Maria’s Day pops back in the 24th. Needs more dragon-slaying. Eric the Circle for the 24th, this one by Dennill, gets in here by throwing some casual talk about arcs around. That and π. The given formula looks like nonsense to me. has parts that make sense. The first part will tell you what radian measure corresponds to 94 degrees, and that’s fine. Mathematicians will tend to look for radian measures rather than degrees for serious work. The sine of 94 degrees they might want to know. Subtracting the two? I don’t see the point. I dare to say this might be a bunch of silliness. Cathy Law’s Claw for the 25th writes off another Powerball lottery loss as being bad at math and how it’s like algebra. Seeing algebra in lottery tickets is a kind of badness at mathematics, yes. It’s probability, after all. Merely playing can be defended mathematically, though, at least for the extremely large jackpots such as the Powerball had last week. If the payout is around 750 million dollars (as it was) and the chance of winning is about one in 250 million (close enough to true), then the expectation value of playing a ticket is about three dollars. If the ticket costs less than three dollars (and it does; I forget if it’s one or two dollars, but it’s certainly not three), then, on average you could expect to come out slightly ahead. Therefore it makes sense to play. Except that, of course, it doesn’t make sense to play. On average you’ll lose the cost of the ticket. The on-average long-run you need to expect to come out ahead is millions of tickets deep. The chance of any ticket winning is about one in 250 million. You need to play a couple hundred million times to get a good enough chance of the jackpot for it to really be worth it. Therefore it makes no sense to play. Mathematical logic therefore fails us: we can justify both playing and not playing. We must study lottery tickets as a different thing. They are (for the purposes of this) entertainment, something for a bit of disposable income. Are they worth the dollar or two per ticket? Did you have other plans for the money that would be more enjoyable? That’s not my ruling to make. Samson’s Dark Side Of The Horse for the 25th just hurts my feelings. Why the harsh word, Samson? Anyway, it’s playing on the typographic similarity between 0 and O, and how we bunch digits together. Grouping together three decimal digits as a block is as old, in the Western tradition, as decimal digits are. Leonardo of Pisa, in Liber Abbaci , groups the thousands and millions and thousands of millions and such together. By 1228 he had the idea to note this grouping with an arc above the set of digits, like a tie between notes on a sheet of music. This got cut down, part of the struggle in notation to write as little as possible. Johannes de Sacrobosco in 1256 proposed just putting a dot every third digit. In 1636 Thomas Blundeville put a | mark after every third digit. (I take all this, as ever, from Florian Cajori’s A History Of Mathematical Notations , because it’s got like everything in it.) We eventually settled on separating these stanzas of digits with a , or . mark. But that it should be three digits goes as far back as it could. It wasn’t like the week wasn’t busy. Comic Strip Master Command sent out as many mathematically-themed comics as I might be able to use. But they were again ones that don’t leave me much to talk about. I’ll try anyway. It was looking like an anthropomorphic-symboles sort of week, too. Tom Thaves’s Frank and Ernest for the 30th of July is an anthropomorphic-symbols joke. The tick marks used for counting make an appearance and isn’t that enough? Maybe. Dan Thompson’s Brevity for the 31st is another entry in the anthropomorphic-symbols joke contest. This one sticks to mathematical symbols, so if the Frank and Ernest makes the cut this week so must this one. 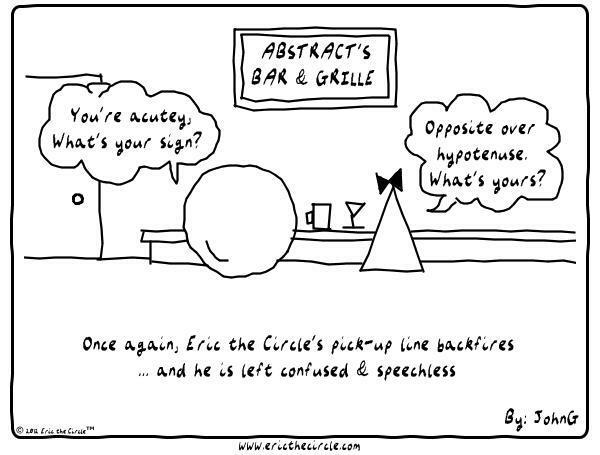 Eric the Circle for the 31st, this installment by “T daug”, gives the slightly anthropomorphic geometric figure a joke that at least mentions a radius, and isn’t that enough? What catches my imagination about this panel particularly is that the “fractured radius” is not just a legitimate pun but also resembles a legitimate geometry drawing. Drawing a diameter line is sensible enough. Drawing some other point on the circle and connecting that to the ends of the diameter is also something we might do. 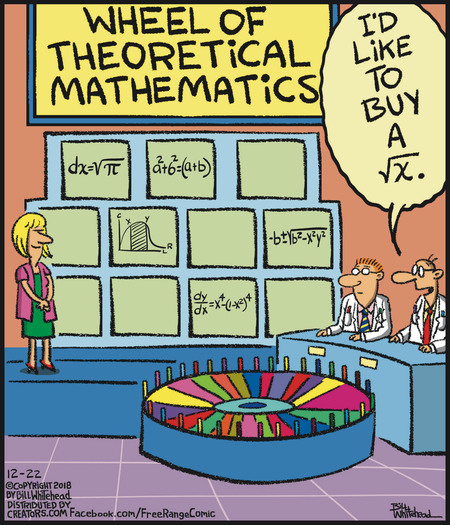 Scott Hilburn’s The Argyle Sweater for the 1st of August is one of the logical mathematics jokes you could make about snakes. The more canonical one runs like this: God in the Garden of Eden makes all the animals and bids them to be fruitful. And God inspects them all and finds rabbits and doves and oxen and fish and fowl all growing in number. All but a pair of snakes. God asks why they haven’t bred and they say they can’t, not without help. What help? They need some thick tree branches chopped down. The bemused God grants them this. God checks back in some time later and finds an abundance of baby snakes in the Garden. But why the delay? “We’re adders,” explain the snakes, “so we need logs to multiply”. This joke absolutely killed them in the mathematics library up to about 1978. I’m told. John Deering’s Strange Brew for the 1st is a monkeys-at-typewriters joke. It faintly reminds me that I might have pledged to retire mentions of the monkeys-at-typewriters joke. But I don’t remember so I’ll just have to depend on saying I don’t think I retired the monkeys-at-typewriters jokes and trust that someone will tell me if I’m wrong. Dana Simpson’s Ozy and Millie rerun for the 2nd name-drops multiplication tables as the sort of thing a nerd child wants to know. They may have fit the available word balloon space better than “know how to diagram sentences” would. Mark Anderson’s Andertoons for the 3rd is the reassuringly normal appearance of Andertoons for this week. It is a geometry class joke about rays, line segments with one point where there’s an end and … a direction where it just doesn’t. And it riffs on the notion of the existence of mathematical things. At least I can see it that way. Rick Kirkman and Jerry Scott’s Baby Blues for the 5th of August, 2017. Hammie totally blew it by saying “about forty-seven”. Too specific a number to be a plausible lie. “About forty” or “About fifty”, something you can see as the result of rounding off, yes. He needs to know there are rules about how to cheat. Rick Kirkman and Jerry Scott’s Baby Blues for the 5th is a rounding-up joke that isn’t about herds of 198 cattle. Stephen Bentley’s Herb and Jamaal for the 5th tosses off a mention of the New Math as something well out of fashion. There are fashions in mathematics, as in all human endeavors. It startles many to learn this. You know we’re getting near the end of the (United States) school year when Comic Strip Master Command orders everyone to clear out their mathematics jokes. I’m assuming that’s what happened here. Or else a lot of cartoonists had word problems on their minds eight weeks ago. Also eight weeks ago plus whenever they originally drew the comics, for those that are deep in reruns. It was busy enough to split this week’s load into two pieces and might have been worth splitting into three, if I thought I had publishing dates free for all that. Larry Wright’s Motley Classics for the 28th of May, a rerun from 1989, is a joke about using algebra. Occasionally mathematicians try to use the the ability of people to catch things in midair as evidence of the sorts of differential equations solution that we all can do, if imperfectly, in our heads. But I’m not aware of evidence that anyone does anything that sophisticated. I would be stunned if we didn’t really work by a process of making a guess of where the thing should be and refining it as time allows, with experience helping us make better guesses. There’s good stuff to learn in modeling how to catch stuff, though. Michael Jantze’s The Norm Classics rerun for the 28th opines about why in algebra you had to not just have an answer but explain why that was the answer. I suppose mathematicians get trained to stop thinking about individual problems and instead look to classes of problems. Is it possible to work out a scheme that works for many cases instead of one? If it isn’t, can we at least say something interesting about why it’s not? And perhaps that’s part of what makes algebra classes hard. To think about a collection of things is usually harder than to think about one, and maybe instructors aren’t always clear about how to turn the specific into the general. Also I want to say some very good words about Jantze’s graphical design. The mock textbook cover for the title panel on the left is so spot-on for a particular era in mathematics textbooks it’s uncanny. The all-caps Helvetica, the use of two slightly different tans, the minimalist cover art … I know shelves stuffed full in the university mathematics library where every book looks like that. Plus, “[Mathematics Thing] And Their Applications” is one of the roughly four standard approved mathematics book titles. He paid good attention to his references. Gary Wise and Lance Aldrich’s Real Life Adventures for the 28th deploys a big old whiteboard full of equations for the “secret” of the universe. This makes a neat change from finding the “meaning” of the universe, or of life. The equations themselves look mostly like gibberish to me, but Wise and Aldrich make good uses of their symbols. The symbol , a vector-valued quantity named B, turns up a lot. This symbol we often use to represent magnetic flux. The B without a little arrow above it would represent the intensity of the magnetic field. Similarly an turns up. This we often use for magnetic field strength. While I didn’t spot a — electric field — which would be the natural partner to all this, there are plenty of bare E symbols. Those would represent electric potential. And many of the other symbols are what would naturally turn up if you were trying to model how something is tossed around by a magnetic field. Q, for example, is often the electric charge. ω is a common symbol for how fast an electromagnetic wave oscillates. (It’s not the frequency, but it’s related to the frequency.) The uses of symbols is consistent enough, in fact, I wonder if Wise and Aldrich did use a legitimate sprawl of equations and I’m missing the referenced problem. John Graziano’s Ripley’s Believe It Or Not for the 28th mentions how many symbols are needed to write out the numbers from 1 to 100. Is this properly mathematics? … Oh, who knows. It’s just neat to know. Mark O’Hare’s Citizen Dog rerun for the 29th has the dog Fergus struggle against a word problem. Ordinary setup and everything, but I love the way O’Hare draws Fergus in that outfit and thinking hard. The Eric the Circle rerun for the 29th by ACE10203040 is a mistimed Pi Day joke. 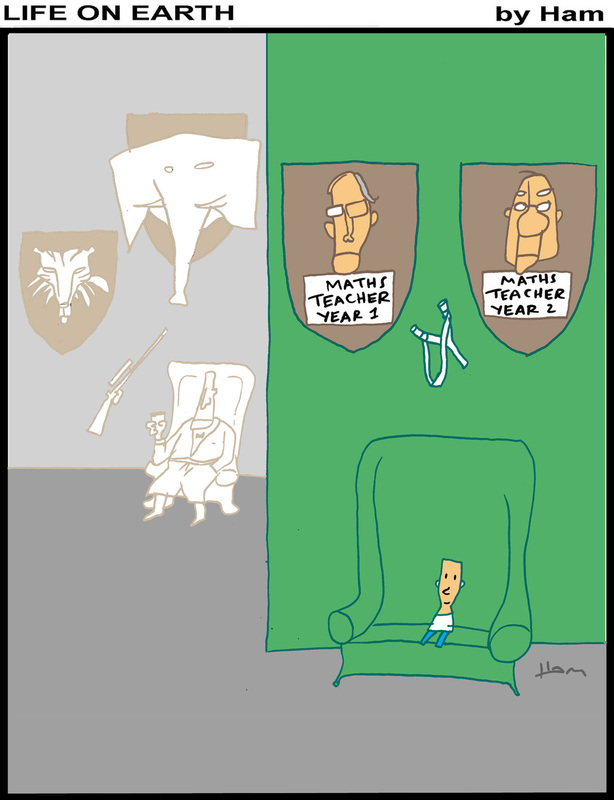 Bill Amend’s FoxTrot Classic for the 31st, a rerun from the 7th of June, 2006, shows the conflation of “genius” and “good at mathematics” in everyday use. Amend has picked a quixotic but in-character thing for Jason Fox to try doing. Euclid’s Fifth Postulate is one of the classic obsessions of mathematicians throughout history. Euclid admitted the thing — a confusing-reading mess of propositions — as a postulate because … well, there’s interesting geometry you can’t do without it, and there doesn’t seem any way to prove it from the rest of his geometric postulates. So it must be assumed to be true. There isn’t a way to prove it from the rest of the geometric postulates, but it took mathematicians over two thousand years of work at that to be convinced of the fact. But I know I went through a time of wanting to try finding a proof myself. It was a mercifully short-lived time that ended in my humbly understanding that as smart as I figured I was, I wasn’t that smart. We can suppose Euclid’s Fifth Postulate to be false and get interesting geometries out of that, particularly the geometries of the surface of the sphere, and the geometry of general relativity. Jason will surely sometime learn. I was hit by a massive computer malfunction this week, the kind that forced me to buy a new computer and spend half a week copying stuff over from a limping hard drive and hoping it would maybe work if I held things just right. Mercifully, Comic Strip Master Command gave me a relatively easy week. No huge rush of mathematically-themed comic strips and none that are going to take a thousand words of writing to describe. Let’s go. Sam Hepburn’s Questionable Quotebook for the 14th includes this week’s anthropomorphic geometry sketch underneath its big text block. Eric the Circle for the 15th, this one by “Claire the Square”, is the rare Eric the Circle to show off properties of circles. So maybe that’s the second anthropomorphic geometry sketch for the week. If the week hadn’t been dominated by my computer woes that might have formed the title for this edition. Werner Wejp-Olsen’s Inspector Danger’s Crime Quiz for the 15th puts a mathematician in mortal peril and leaves him there to die. As is traditional for this sort of puzzle the mathematician left a dying clue. (Mathematicians were similarly kind to their investigators on the 4th of July, 2016 and the 9th of July, 2012. I was expecting the answer to be someone with a four-letter and an eight-letter name, none of which anybody here had. Doesn’t matter. It’ll never stand up in court. John Graziano’s Ripley’s Believe It Or Not for the 17th features one of those astounding claims that grows out of number theory. Graziano asserts that there are an astounding 50,613,244,155,051,856 ways to score exactly 100 points in (ten-pin) bowling. I won’t deny that this seems high to me. But partitioning a number — that is, taking a (positive) whole number and writing down the different ways one can add up (positive) whole numbers to get that sum — often turns up a lot of possibilities. That there should be many ways to get a score of 100 by adding between ten and twenty numbers that could be between zero and ten each, plus the possibility of adding pairs of the numbers (for spares) or trios of numbers (for strikes) makes this less astonishing. Wikipedia led me to this page, from Balmoral Software, about all the different ways there are to score different numbers. The most surprising thing it reveals to me is that 100 isn’t even the score with the greatest number of possible scores. 77 is. There are 172,542,309,343,731,946 ways to score exactly 77 points. I agree this ought to make me feel better about my game. It doesn’t. It turns out there are, altogether, something like 5,726,805,883,325,784,576 possible different outcomes for a bowling game. And how we can tell that, given there’s no practical way to go and list all of them, is described at the end of the page. The technique is called “divide and conquer”. There’s no way to list all the outcomes of ten frames of bowling, but there’s certainly a way to list all the outcomes of one. Or two. Or three. So, work out how many possible scores there would be in few enough frames you can handle that. Then combine these shortened games into one that’s the full ten frames. There’s some trouble in matching up the ends of the short games. A spare or a strike in the last frame of a shortened game means one has to account for the first or first two frames of the next one. But this is still an easier problem than the one we started with. Bill Amend’s FoxTrot Classics for the 18th (rerun from the 25th of May, 2006) is your standard percentages and infinities joke. Really would have expected Paige’s mother to be wise to this game by now, but this sort of thing happens. It’s another busy enough week for mathematically-themed comic strips that I’m dividing the harvest in two. There’s a natural cutting point since there weren’t any comics I could call relevant for the 15th. But I’m moving a Saturday Morning Breakfast Cereal of course from the 16th into this pile. That’s because there’s another Saturday Morning Breakfast Cereal of course from after the 16th that I might include. I’m still deciding if it’s close enough to on topic. We’ll see. John Graziano’s Ripley’s Believe It Or Not for the 12th mentions the “ Futurama Theorem”. The trivia is true, in that writer Ken Keeler did create a theorem for a body-swap plot he had going. The premise was that any two bodies could swap minds at most one time. So, after a couple people had swapped bodies, was there any way to get everyone back to their correct original body? There is, if you bring two more people in to the body-swapping party. It’s clever. From reading comment threads about the episode I conclude people are really awestruck by the idea of creating a theorem for a TV show episode. The thing is that “a theorem” isn’t necessarily a mind-boggling piece of work. It’s just the name mathematicians give when we have a clearly-defined logical problem and its solution. A theorem and its proof can be a mind-wrenching bit of work, like Fermat’s Last Theorem or the Four-Color Map Theorem are. Or it can be on the verge of obvious. Keeler’s proof isn’t on the obvious side of things. But it is the reasoning one would have to do to solve the body-swap problem the episode posited without cheating. Logic and good story-telling are, as often, good partners. Teresa Burritt’s Frog Applause is a Dadaist nonsense strip. But for the 13th it hit across some legitimate words, about a 14 percent false-positive rate. This is something run across in hypothesis testing. The hypothesis is something like “is whatever we’re measuring so much above (or so far below) the average that it’s not plausibly just luck?” A false positive is what it sounds like: our analysis said yes, this can’t just be luck, and it turns out that it was. This turns up most notoriously in medical screenings, when we want to know if there’s reason to suspect a health risk, and in forensic analysis, when we want to know if a particular person can be shown to have been a particular place at a particular time. A 14 percent false positive rate doesn’t sound very good — except. Suppose we are looking for a rare condition. Say, something one person out of 500 will have. A test that’s 99 percent accurate will turn up positives for the one person who has got it and for five of the people who haven’t. It’s not that the test is bad; it’s just there are so many negatives to work through. If you can screen out a good number of the negatives, though, the people who haven’t got the condition, then the good test will turn up fewer false positives. So suppose you have a cheap or easy or quick test that doesn’t miss any true positives but does have a 14 percent false positive rate. That would screen out 430 of the people who haven’t got whatever we’re testing for, leaving only 71 people who need the 99-percent-accurate test. This can make for a more effective use of resources. Gary Wise and Lance Aldrich’s Real Life Adventures for the 13th is an algebra-in-real-life joke and I can’t make something deeper out of that. Mike Shiell’s The Wandering Melon for the 13th is a spot of wordplay built around statisticians. Good for taping to the mathematics teacher’s walls. Eric the Circle for the 14th, this one by “zapaway”, is another bit of wordplay. Tans and tangents. Zach Weinersmith’s Saturday Morning Breakfast Cereal for the 16th identifies, aptly, a difference between scientists and science fans. Weinersmith is right that loving trivia is a hallmark of a fan. Expertise — in any field, not just science — is more about recognizing patterns of problems and concepts, ways to bring approaches from one field into another, this sort of thing. And the digits of π are great examples of trivia. There’s no need for anyone to know the 1,681st digit of π. There’s few calculations you could ever do when you needed more than three dozen digits. But if memorizing digits seems like fun then π is a great set to learn. e is the only other number at all compelling. The thing is, it’s very hard to become an expert in something without first being a fan of it. It’s possible, but if a field doesn’t delight you why would you put that much work into it? So even though the scientist might have long since gotten past caring how many digits of π, it’s awfully hard to get something memorized in the flush of fandom out of your head. I know you’re curious. I can only remember π out to 3.14158926535787962. I might have gotten farther if I’d tried, but I actually got a digit wrong, inserting a ‘3’ before that last ’62’, and the effort to get that mistake out of my head obliterated any desire to waste more time memorizing digits. For e I can only give you 2.718281828. But there’s almost no hope I’d know that far if it weren’t for how e happens to repeat that 1828 stanza right away. I had started to think the mathematics references in the comics pages were fading out and I might not have an installment to offer anytime soon. Then, on April 3, Pab Sugenis’s The New Adventures of Queen Victoria — a clip art comic strip which supposes the reader will recognize an illustration of King Edward VI — skipped its planned strip for the day (Sugenis’s choice, he says) and ran a Fuzzy Bunny Time strip calling on pretty much the expected rabbits and mathematics comic strip. (Some people in the Usenet group alt.fan.cecil-adams, which I read reliably and write to occasionally, say Sugenis was briefly a regular; perhaps so, but I don’t remember.) This would start a bumper crop of math strips for the week.